Today I am very happy to introduce you to Anna and Esther from Kunstkinder Mag! They are a super-fashionable duo from Hamburg and also know quite a lot about fair fashion. If you ever think that ethical fashion is out of style and just hoodies and t-shirts, head over to their site. They actually just launched a new and exciting project, die konsumentin, an online magazine for stylish yet sustainable women. It’s beautiful, you’ll see. Tell us something about yourself and die konsumentin! We are Anna and Esther, a Girl-Duo from Hamburg, Germany. We started advocating Slow and Fair Fashion two years ago, being students still, via our little online magazine called „Kunstkinder Magazin“. Recently, we worked on a little relaunch into something a little bigger, the online magazine die konsumentin. That’s how we grew up from „just“ being friends and partners-in-crime into being real co-workers! If you could sum up your life at the moment, what would it be? Anna: It’s quite unpredictable at the moment, as I’m hopping in-between university classes and freelance jobs. This is why I enjoy dressing up much more than usually! Everyday brings a new challenge, new work environments and new faces. Esther: I totally agree! Last year I approached Slow Fashion with reducing my wardrobe to just a few favourite pieces. This year I especially enjoy recombining and reinventing them. Where and when did you find your everlasting piece? 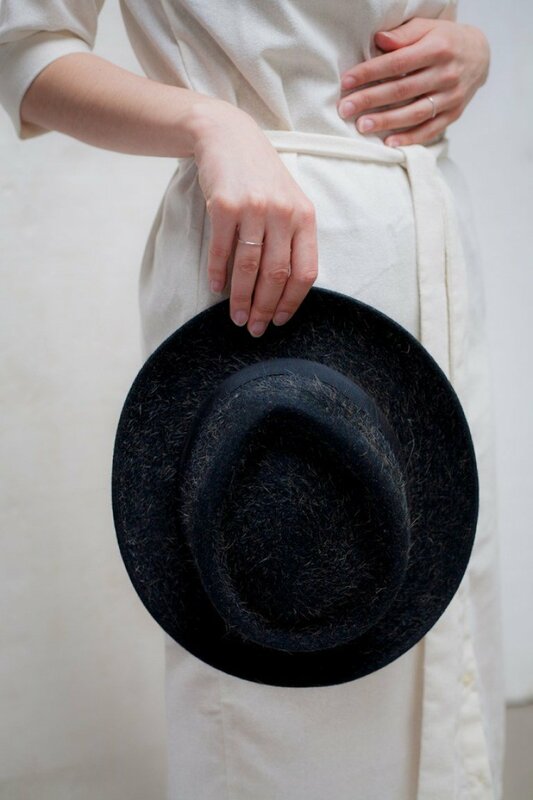 Anna: My everlasting piece is the absolute-perfect vintage hat I found at a Vintage Kilo Sale the other day. It’s been accompanying me on every travel vacation ever since. Esther: This was our very first VinoKilo event in Hamburg, where I happened to find this amazing suede leather jacket, too. After that event we kept in touch with the people behind and became friends. Thats why it is such a special piece to me. Is there a special story connected to this outfit? Anna: We shot and styled these exact two outfits for our ongoing little series called „Slow Fashion Manifest“. It’s so much fun to mix special vintage pieces with cleaner contemporary clothing. With these two outfits, we want to show that. This way, we built a well-styled capsule wardrobe that lasts the test of time. Why do you think slow fashion is important? Esther: Fashion plays a pretty big part in our daily lives. It adds a lot of fun to our everyday routines. We want to enjoy this opportunity without compromising the well-being of our contemporaries by harming our environment. And, of course, without denying future generations to consume and satisfy their needs as we are today. Thank you, Esther and Anna! PS: More Everlasting Apparel features, and more about ethical fashion.